Who doesn't love a great movie about music, especially when its about such a massive icon? Coming up shortly, we're getting Bohemian Rhapsody which will chronicle the story of Queen and their legendary frontman Freddie Mercury. But, we're also getting the life story of the Rocketman himself, Elton John. 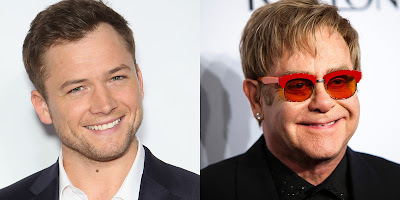 Starring Taron Egerton of the Kingsman series, the new movie about Elton is said to be a musical fantasy. Now, a few days before the first trailer drops, the studio has released this amazing image that shows Egerton in classic Elton style, kicking back aboard a private plane in the '70s. As one of the biggest singers of all time, this should be an interesting take on his life and amazing time in the spotlight. And to cap it off, Egerton looks absolutely perfect in the role.